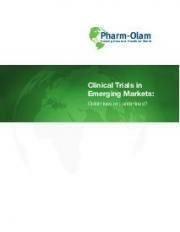 Clinical Trials in Emerging Markets: Goldmines or Landmines? Over the past decade, biopharmaceutical companies have increasingly turned to emerging markets as a way to reduce clinical trial costs and timelines. Areas such as Eastern Europe, India, and Latin America—with their ready population of treatment naïve patients—can be an answer to the intense competition for patients seen in developed markets. Many of the countries within these regions may now be considered as “emerged” countries but yet, conducting trials in these regions does require some special attention and expertise. Before deciding to conduct studies in these areas, companies should have a full appreciation for the ethical, medical, regulatory, legal, and operational hurdles that must be surmounted for success. Here we highlight a number of those issues and offer our recommendations for how sponsor companies can deal with them effectively. Sponsors’ interest in emerging markets as loci for clinical trials has been mounting for at least a decade. In 2011, this phenomenon reached a tipping point: for the first time, more data were submitted to the European Medicines Agency in marketing-authorization applications on patients from outside of Europe and North American than from within those areas. While the “Rest of the World” designation includes some mature markets such as Australia and Japan, there is, nonetheless, a clear takeaway: emerging markets have become a hot bed of trial activity.